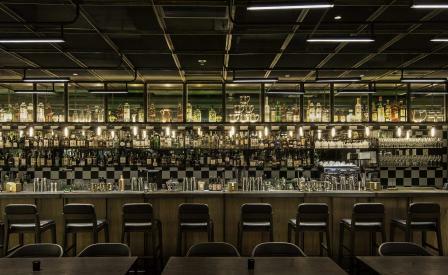 The latest offering from hospitality pundit Yenn Wong and Michelin-starred chef Jason Atherton holds court at PMQ, an enclave of historic buildings in Hong Kong’s creative district revamped to house creative studios, workshops and cafés. Shanghai-based design firm Neri & Hu nod to the classic colonial setting, steering clear of pastiche with a relaxed ground floor café and bar featuring simple steel and wood interiors framed by teal blue framed floor-to-ceiling windows that open onto a terrace and landscaped garden. Inside is local artist Adrian Wong’s geometric installation of barbershop lights, rustic chic brass and copper fixtures, and Aberdeen Street Social’s takeaway baked goodies and homemade hot chocolate. Upstairs, accessed via an Art Deco-inspired hallway with Arne Jacobsen-decorated wallpaper and crisp green and white tiling, is Atherton’s fuss-free modern British bistro with an eye-pleasing palette of weathered oak, custom-made furniture, bronze mesh screens and green-tinted glass. A semi-open kitchen serves the likes of braised ox cheek with roasted bone marrow and sourdough crumb.